The law and regulations on special needs (England) changed in September 2014. More. Children and young people with a statement were not immediately switched to the new system. Both systems ran in tandem for under-16s till the end of March 2018. Please see this notice from the Department for Education regarding statements in the process of being appealed beyond March 2018. All new assessments since September 2014 have been for Education Health and Care plans [EHCPs]. DfE Newsletter March 1st 2018 Transition provisions set out in the transition regulations (SI 2014/2270) enable existing statements to continue in place under the Education Act 1996 until an EHC needs assessment is concluded. This applies regardless of whether the Statement would have lapsed under the previous system. For any child or young person in that position, local authorities will remain responsible for ensuring that the provision and placement in their statement continues to be made. If you are moving to another area and still only have a statement and not an EHCP, the receiving local authority may bring forward the annual review of the Statement or conduct a new assessment, but they are not obliged to do so – they may decide to accept and implement the Statement in its current form. Where LAs have Statements of SEN remaining beyond the end of March, they will be in breach of a statutory duty. There will be follow-up, by DfE, with every LA in that position. Click here for a pdf or jpg of the relevant portion of the newsletter. School funding in England is no longer tied to the statement (or EHCP). The way schools see it is that they are expected to find the first £6,000 out of their budget (core funding) before being able to ask for more if they can demonstrate a need. Therefore heads may say that pupils with SEN cost the school money rather than bringing extra revenue. Home educating parents can request an EHC needs assessment which may ultimately result in an EHCP. You will need to collect evidence to demonstrate that your child has significantly greater difficulties than other children of the same age and would require much greater support than other children if he/she attended school or has a disability which prevents them from accessing their education in an ordinary school. More The process may take some time. If the child were a pupil in school the school would ALSO have to show that they had already made various adjustments and implemented various strategies and that these had not worked. This is known as the "graduated approach" or "Assess Plan Do Review" cycle. In my view this is a school-based strategy which relates to changes in school core funding and should not be imposed wholesale on home educators as a way to delay making an EHC needs assessment, although your case will undoubtedly be strengthened by any evidence of what has already not worked. In some areas speech therapy or occupational therapy may be available via "health" rather than "education". It is not possible to get a plan purely on health needs, the child will also have to have a learning difficulty or a disability which meets specific criteria. The route for help from social care (eg short breaks or respite) is via a disabled child assessment rather than trying to get an EHCP from scratch. More. See also Disabled Children Legal Handbook, Steve Broach. SEN Regulation 6. (1) says "Where the local authority secures an EHC needs assessment for a child or young person, it must seek the following advice and information, on the needs of the child or young person, and what provision may be required to meet such needs and the outcomes that are intended to be achieved by the child or young person receiving that provision"
SEN Regulation 6. (4) says "the local authority must not seek any of the advice referred to in paragraphs (1)(b) to (h) if such advice has previously been provided for any purpose and the person providing that advice, the local authority and the child’s parent or the young person are satisfied that it is sufficient for the purposes of an EHC needs assessment. In other words, if the family does not agree that the authority's existing reports are fit for purpose (because eg they do not include sufficient detail about the child or young person's needs AND/OR do not provide advice about outcomes + strategies for achieving outcomes) then the authority MUST obtain new advice. Professional reports, information and advice will go into section K of the Plan. The place for special educational provision in the EHCP is section F. Special educational provision in section F can include health and social care provision as long as the provision "educates or trains" the child/young person. Health needs relating to SEN will be set out in section C and social care needs relating to SEN will be set out in section D.
My Survey showed that two thirds of home educated children with special needs didn't have a statement or Plan. This might be because the school refuses to make a referral, or the EHCP process takes too long while children are stressed by school, or else the proposed support is so bad that parents just take the child out of school instead. The new SEN Code envisages two different types of "home education." One option - set out in 10.32 - is where parents take responsibility for making provision, with no help from the LA, which is what home educators would usually understand as "home education". 2 out of 3 parents in my Survey said their child didn't get any of the support set out in the statement once they were home educated, and those who said their child did get some support while they were home educated generally wanted to qualify this by explaining that it was because they provided or paid for it themselves. The new SEN Code says "10.35 Local authorities should not assume that because the provision being made by parents is different from that which was being made or would have been made in school that the provision is necessarily unsuitable. Local authorities should also consider using their power to help parents make suitable provision." If your local authority tries to suggest that you must do what is set out for schools, please get in touch with me for further information on what to do next. 10.30 Under section 7 of the Education Act 1996 parents have the right to educate children, including children with SEN, at home. Home education must be suitable to the child’s age, ability, aptitude and SEN. Local authorities should work in partnership with, and support, parents to ensure that the special educational needs of these children are met where the local authority already knows the children have SEN or the parents have drawn the children’s special needs to the authority’s attention. Local authorities do not have a duty under section 22 of the Children and Families Act 2014 to assess every home educated child to see whether or not they have SEN. The high needs block of the Dedicated Schools Grant is intended to fund provision for all relevant children and young people in the authority’s area, including home educated children. Local authorities should fund the SEN needs of home educated children where it is appropriate to do so. Guidance is available to local authorities from the Department for Education on funding provision for home educated children. 10.31 In cases where local authorities and parents agree that home education is the right provision for a child or young person with an EHC plan, the plan should make clear that the child or young person will be educated at home. If it does then the local authority, under Section 42(2) of the Children and Families Act 2014, must arrange the special educational provision set out in the plan, working with the parents. Under Section 19 of the Act, a local authority must have regard to the views, wishes and feelings of the child and his or her parents, or the young person. 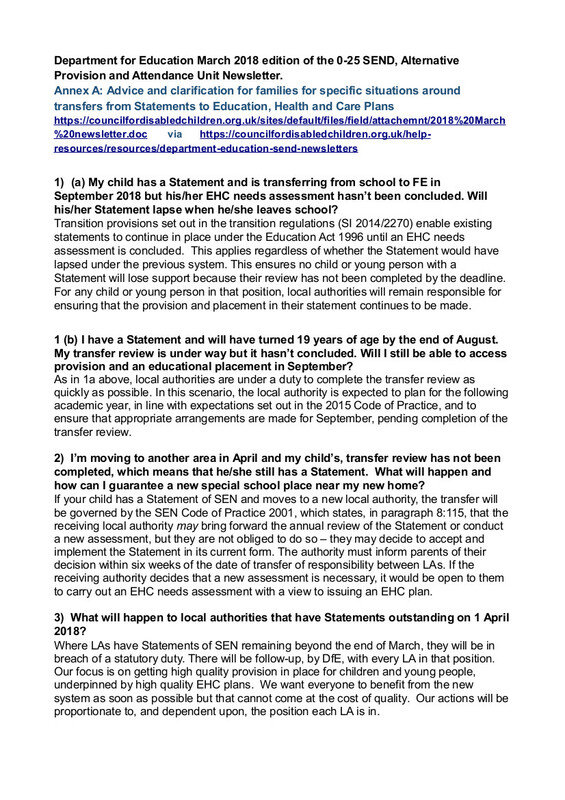 10.32 In cases where the EHC plan gives the name of a school or type of school where the child will be educated and the parents decide to educate at home, the local authority is not under a duty to make the special educational provision set out in the plan provided it is satisfied that the arrangements made by the parents are suitable. The local authority must review the plan annually to assure itself that the provision set out in it continues to be appropriate and that the child's SEN continue to be met (see Chapter 9). Where the local authority has decided that the provision is appropriate, it should amend the plan to name the type of school that would be suitable but state that parents have made their own arrangements under section 7 of the Education Act 1996. 10.33 Where a child or young person is a registered pupil and the parent decides to home educate, the parent must notify the school in writing that the child or young person is receiving education otherwise than at school and the school must then remove the pupil's name from the admission register. If the school is a special school, the local authority must give consent for the child's name to be removed, but this should not be a lengthy or complex process. There is no provision in law for a ‘trial period’ of home education. 10.34 Local authorities do not have the right of entry to the family home to check that the provision being made by the parents is appropriate and may only enter the home at the invitation of the parents. Parents should be encouraged to see this process as part of the authority’s overall approach to home education of pupils with SEN, including the provision of appropriate support, rather than an attempt to undermine the parents' right to home educate. 10.35 Local authorities should not assume that because the provision being made by parents is different from that which was being made or would have been made in school that the provision is necessarily unsuitable. Local authorities should also consider using their power to help parents make suitable provision. 10.36 In some cases a local authority will conclude that, even after considering its power to provide support to home educating parents, the provision that is or could be made for a child or young person with an EHC plan does not meet the child or young person's needs. The local authority is required to intervene through the school attendance order framework 'if it appears...that a child of compulsory school age is not receiving suitable education'. The serving of a school attendance order is a last resort if all attempts to improve provision are unsuccessful. 'Suitable education' means efficient full-time education suitable to the child or young person's age, ability and aptitude and to any SEN he or she may have. 10.37 Parents may also home educate children who have SEN but do not have EHC plans. As with children and young people with EHC plans, local authorities should work with parents and consider whether to provide support in the home to help the parents make suitable provision. Information about the right to request an EHC assessment and the right to appeal should be available to all parents including those who are considering home education because they feel that the special educational support being provided in the school is insufficient to meet the child or young person's needs. 10.38 Young people may also be educated at home in order to meet the requirement to participate in education and training until the age of 18. Local authorities should involve parents, as appropriate, in the reviews of EHC plans of home-educated young people who are over compulsory school age. Parents wishing to take their child out of school for home education must write to the school and request that the child's name be deleted from the school roll. The process is the same irrespective of whether a child has an EHCP. In some areas, the local authority may want to bring forward the annual review once a child is home educated. In other cases the council may say that there has to be a meeting or that the "request" or "application" must be considered by a panel. None of this is required by law. Parents don't have to ask permission or pass a test or inspection before starting home education. The child's name should be deleted from the school roll following the parent's notification that the child is being home educated. Parents don't have to prove that the child's SEN cannot be met in school because school is not the default. Neither do parents have to prove that they can meet all their child's special needs before they are allowed to home educate, or ensure that the child's special educational needs are fulfilled. In some cases, the home educating family will be able to make the case that the EHCP is irrelevant and should cease to remain in place. To initiate the process for ceasing the EHCP the family can either wait till the next Annual Review or write to the authority and request that the next Review be brought forward. The EHCP should not be ceased without being reviewed. Parents should be aware that asking for the Plan to be ceased does not mean the LA has to agree. The new SEND Code says "a local authority may cease to maintain an EHC plan only if it determines that it is no longer necessary for the plan to be maintained, or if it is no longer responsible for the child or young person. The circumstances where a local authority may determine that it is no longer necessary for the EHC plan to be maintained include where the child or young person no longer requires the special educational provision specified in the EHC plan..."
On the other hand, an EHCP could be very useful when it comes to arranging extra time or other adaptations for exams. It may also be useful for making the transition back into formal education pre or post-16, and can serve as a passport to important benefits or support elsewhere. Many families saw no benefit and found the review process burdensome and intrusive but according to my Survey parents still felt they wanted to hang on to it for insurance. This article is http://ehe-sen.org.uk/statement.php. The following links to other websites are contained in the article, displayed as citations to aid you in printing the document. © 26/04/2019 13:42:24, Fiona Nicholson. Creative Commons BY-NC-ND. standards compliant html5.